Dehradun. Army Rally will be held from 03-06-2019 to 17-06-2019. 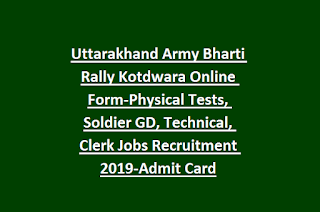 Uttarakhand state candidates can apply online for this Army recruitment rally from 04-04-2019 to 18-05-2019. Official website to apply online for this UK Army Bharti rally is www.joinindianarmy.nic.in. 8th Class/10th Class/12th passed candidates who applied online they can attend the UK Army Bharti rally at AT VC GBS CAMP KOTDWARA. Admit Card for this UK Army rally Kotdwara will be mailed from 19-05-2019. 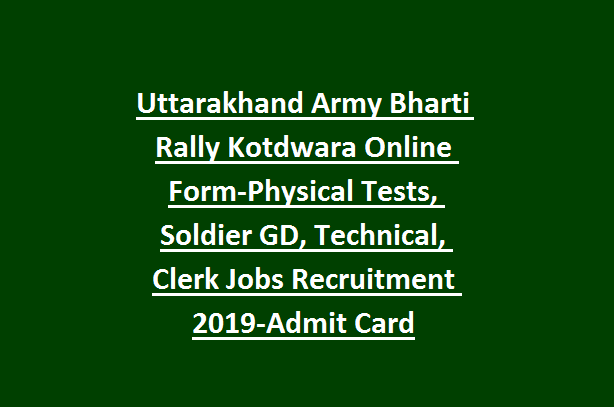 UK Kotdwara Army Recruitment Rally Physical Tests information, Height, Weight, Chest, age limits, online form procedure, and other details are updated below. For Soldier Tradesman/Technical/Store Keeper/Clerk age limits are 17 ½ to 23 years. Selection for this Army Soldier jobs through physical standards tests, physical endurance tests, medical tests and CEE. Running-1600 meters-in 05 Min 45 seconds. Chest for all posts is 77+5 cms. Height for Soldier GD IDG candidates is 157 cms. For Soldier clerk/storekeeper/inventory management posts 162 cms and for all other Soldier posts height is 163 cms. Apply online to for this the recruitment rally at Kotdwara. Uttarkashi, Chamoli, Tehri, Pauri Garhwal, Rudraprayag, Haridwar & Dehradun district scandidates of Uttarakhand state is eligible to apply at www.joinindianarmy.nic.in. Admit Card will be send to candidates registered email to candidates.